The lovely ladies at Pickle Pie offered us one of their gorgeous framed personal prints as a Father’s Day gift and I jumped at the chance. Pickle Pie Creations is a lovely website where you can create a one-off gift, as they put it, ‘quite literally packed with love’! 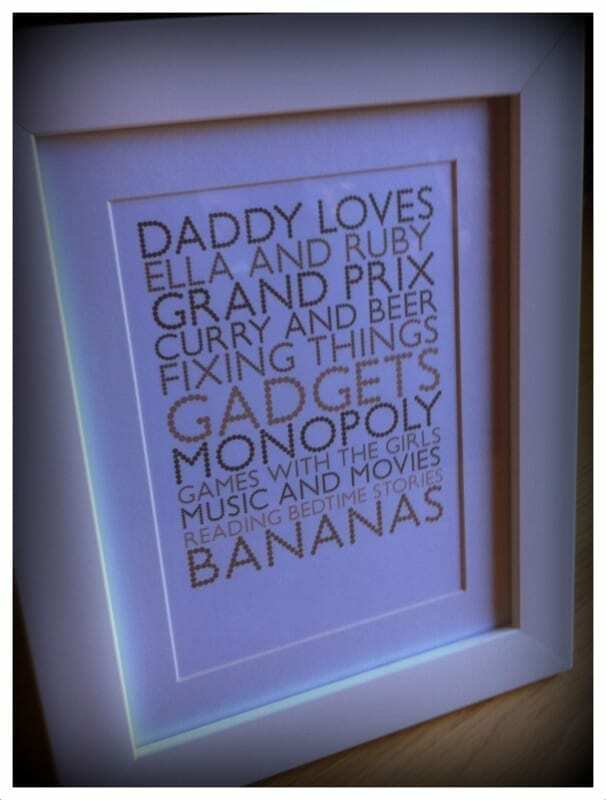 This lovely piece of artwork is put together from the words you send in; words that epitomise that special person. The girls and I sat down one tea-time and came up with our list of words that best described their Dad. I did have to vet it and remove one or two that I’m sure he wouldn’t want plastered up on the wall for everyone to see, but generally they were pretty spot on. All I then had to do was choose the design and colours and we were ready to wait for our personalised Father’s Day Gift. Here’s the final result sent to us with super speedy delivery from Pickle Pie. The pixelated letters in a neutral print coupled with the white frame means that this will fit into any colour scheme in your home. Very stylish and individual; a really special gift for a special person. We’re just thrilled to bits with it. Now I know I received this for free so that always adds to the pleasure but in actual fact this will only cost £12.99 which I think is a great price for something custom made. I like it so much I’m hoping to get one for my own Dad (Dad’s are so hard to buy for aren’t they?). So if you fancy ordering one, hop over to www.picklepiecreations.co.uk and put your order in before the end of May. Now here’s the fun bit. Would you like to win a Pickle Pie Creation? Would you like your own customised wall art maybe for you, your family or as a gift for a special person or couple? Wouldn’t they make a gorgeous wedding gift? Love Chic Living readers can win ANY print in a medium white frame from the Pickle Pie range. All you need to do is leave me a comment and tell me what you will be buying your Dad for Father’s Day this year. Terms and Conditions: Only one entry allowed per household. UK entries only please. Leave a comment on the blog as per the instructions. The competition closes on June 17th at Noon. The winner will be chosen at random and announced on the Love Chic Living Facebook page. The winner must respond within 5 days of being notified. The prize will then be sent direct from Pickle Pie. Disclosure: I was offered a personalised framed print from the Pickle Pie website in exchange for the review. The comments and opinions are genuine, honest and my own. I was thinking of adopting a vine at his local vineyard, so he cam watch it grow and then buy a bottle of wine made from his own vine, he loves things like that! My dad passed away 8 years ago but I still think of him on Father’s Day and usually buy my mum a little something! my dad passed away in december 1999, so i would get him some flowers and get my mum a special gift for such a sad day. I think this year, we will buy a vintage bottle of whisky! He’s a massive whisky fan, so that would be a lovely special gift that he’d enjoy! Definitely a card and drawings from my children, and maybe a visit! Sadly probably nothing as he’ll be away on holiday on Fathers Day. I will send him a text message though. I will be buying my dad something to do with marc bolan/t-rex cos he’s a massive fan and he deserves it. This year, I’ll be buying my Dad a watch. He is NEVER on time ever, his wedding is a few days after so hopefully it will help him be on time for that! Rats, I haven’t bought my dad anything yet …. or come to that, and probably as bad, turned the children into creative machines for my husband. How much time have I got?! My dad left when I was 5 years old and for many years I longed for the love of my father. I met him again as a grown woman and decided I hadn’t missed much! So this year I am looking for something special for my husband, who has been a devoting and loving father to our 3 children. I finally have the love of a very special man. I will be treating my dad to a meal in a nice restaurant with some presents to follow. I don’t often see him due to him working on the other side of the world. Luckily he is home for fathers day this year so will try and make it special. I am going to put together a collage of photos of my children for my dad this year as you can never have enough photos of your grandchildren! I will be making plantain, and a Goat curry with rice and peas West Indian style in memory of my dad who kind of taught me to cook and was instrumental in making me a wee bit chubby in my early teens! Not sure yet = possibly a bottle of single malt. He has everything he could want so I’m stumped! lovely giveaway – i will be buying him some nice bottles of wine! Knowing how disorganised I am, it will be something I have bought from the petrol station on the way to see him! Hi! I might buy my Dad a nice bottle of red wine, Bordeaux. Lovely giveaway! I love my dad so much but he is a big pain, does things like goes and buys loads of DVDs and books that he wants JUST before fathers day, xmas and his birthday so we don’t know what to get! I think this year it’ll be a bottle of Champagne, a stinky cheese and a piccy of his grandkids. Still looking for inspiration . This prize looks lovely. I have just started glass etching so I’m going to be giving my Dad a personalised hand etched glass that I’ve done. I’ve also sorted him a mini photobook with pictures of my little girl for her to give to ‘Grandad’. Dad has been ill and in hopsital for most of the past month so hoping that he’s well enough to enjoy his gifts on the day. Homemade pressies this year…..Money is tight!! Getting the kids to help make cards and a nice big fat chocolate cake! Socks! He gets 3 pairs every year. I will only be sending a card for Sunday, as he is abroad at the moment, but im going to go home as a suprise when he is back in the UK as ive not seen him since xmas. I will be buying my husband (children’s dad) lots of things as its a double celebration, his 30th birthday!! Children have been busy writing up their lists of what they would like to get him for his birthday and what they would like to get him for father’s day……one suggestion was a new car! I’m taking my Dad to the Tank Museum Bovington, Dorset with my children as we love history, we’ll get to spend time together and with my children who, like his other granddaughters he adores and often will take the blame for! Also some Radox as he has a bad back and this in the bath helps to sooth it slightly. I’m going to be buying my Dad some cricket tickets, he loved to play in his day but struggling as he gets older so I think this would be the next best thing as he adores the game! I will be buying my little boys daddy a big personalised chocloate bar!! We are going out for a nice dinner and I’m buying him a robe. I will be buying chocolates and socks. Very original. My Dad is 83 now and when I ask him if there is anything he wants, he always says no, so I’ve booked us a night out to the Theatre to see ‘What the Butler Saw’ . I know he’ll appreciate this! This year we didn’t know what to buy Dad as he has everything he needs so we have settled on vouchers and a personalised card so he can buy something he really wants! I’ll be buying my Dad a bottle of gin. Sadly he’s suffering from dementia now and doesn’t really know who I am so I expect him to be a bit confused when he gets gifts tomorrow because he won’t really understand what’s happening. But at least I know he will enjoy his nightly tipple of a G&T. It’s one of the few things from before he became ill that he still remembers. Money’s tight so my dad rang me and told me not to buy him anything. But… I couldn’t do that, so I’ve bought him 6 DVDs (50 pence each from the car boot sale, lol) and a massive bag of popcorn. He taught me to be thrifty if nothing else. socks, pants and a t-shirt! He’s so hard to buy for I end up getting the same things each year but at least he has a plentiful supply, haha! My dad has been through so much these last 12 months. Due to medical complications he is now an amputee, he was also diagnosed with COPD and he has just come home from spending 3 months in hospital undergoing treatment for lung cancer. During this time he had 4 operations, suffered a fully collapsed lung 6 times and contracted pneumonia. Through it all, he has had a smile on his face and his first thoughts are for his children and grandchildren. Because of this, and because he is immoble at the moment, we are having a special dinner for him, cooked by us, his children at my mum and dad’s this afternoon. We have also bought him a keyring which has 4 charms containing the fingerprints of his grandchildren and we have bought him a watch he has always wanted! A rose bush for the garden. My dad is no longer with us, but I bought my husband a big lucky dip box from Cybercandy so that we could test out the world’s confectionery. I bought my dad a voucher for B&Q. Seems a bit impersonal but he loves his gadgets and this is his idea of heaven! It would’ve been a bottle of whisky when he was still with us, nowadays I still buy one but have a drink or two out of it to his memory! I got my dad a big jar (2.0 L) of Greek yogurt. Too bad he forgot about it very quickly, but heck it was all he wanted!